Land Destroyer: Bangkok Blast: Who Has Ax To Grind With Thailand? 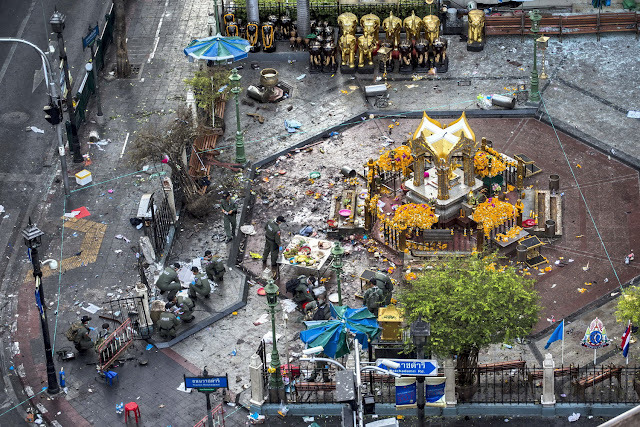 August 18, 2015 (Tony Cartalucci - LD) - The bombing on Monday evening, August 17, 2015, has killed up to 20 people, injured over 100 more, and stands as one of the worst single terrorist attacks in Thailand's capital of Bangkok in recent memory. The attack targeted a religious shrine popular with Asian tourists - particularly from China - who now comprise the largest demographic group of visitors to Thailand. It is clear the attack was a precision strike on Thailand's economy, and specifically against a very precise segment of Thailand's tourist market. Commentators have admitted that many other targets with higher concentrations of tourists exist throughout Bangkok. Terrorists specifically struck the Erawan Shrine in downtown Bangkok to target Thailand's Asian tourists. The Western media has already begun spinning theories as to who carried out the attack - focusing on separatists in Thailand's southern most provinces who have been waging a low-level insurgency for years. Many note, however, that violence rarely unfolds outside of these provinces, and has never been carried out on this scale - especially in Bangkok. Deposed dictator Thaksin Shinawatra and his supporters have also been cited as possible suspects. While southern separatists have never visited violence upon Bangkok, Shinawatra's followers have - and often. They carried out riots that left two shopkeepers dead in 2009. In 2010, they fielded some 300 heavily armed militants on Bangkok's streets, triggering gun battles that left nearly 100 dead and culminated in city-wide arson. They again fielded these same terrorists throughout 2013-2014 to target protests aimed at Shinawatra's regime. 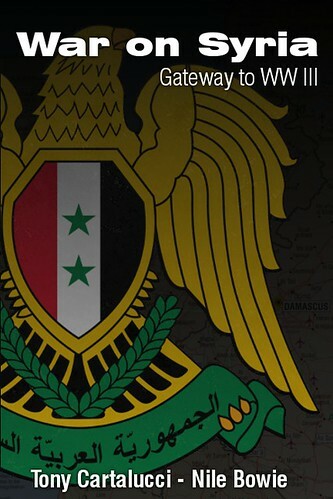 This latest episode left nearly 30 dead and hundreds injured. While no single attack by Shinawatra's followers has rivaled Monday's blast, the total death toll and carnage carried out by his militants in 2010, and again in 2013-2014 certainly exceeded it. The foreign media also speculated terrorists linked to either China's Xinjiang province or even the so-called "Islamic State" (ISIS) may have potentially been involved - perhaps because of the large number of Chinese tourists hit in the attack, and because terrorists from China's Xinjiang province have been trafficked by NATO to Syria to fight along side ISIS. It has been previously reported how the US and its allies have supported both Shinawatra's regime over the past decade Also reported were US-Saudi ties with Thailand's southern separatists and US-Turkish ties with China's Uyghur separatists. With US foreign policy serving as the singular common denominator between all possible suspects, one may be led to ask, "why Thailand?" What ax has the US to grind against Thailand? While Thailand is perceived by many to be a stanch US ally, this originates in Cold War history, not modern reality. During the Vietnam War, Thailand found itself in the middle of a deadly regional conflict and opted to make concessions with the US rather than array itself against it. Thailand had previously used a similar strategy during World War II to mitigate war with Japan at the temporary cost of its sovereignty. However, recently Thailand has drifted from Washington - and not just in terms of US-Thai relations alone, but within the greater context of US ambitions in Asia and in particular, in regards to its long-laid plans to encircle, contain, and "integrate" China in its American-made "international order." In understanding this drift, one can clearly see the means, motivation, and opportunity implicating the US in the recent terrorist attack. (1.) Thailand's ruling establishment has steadily resisted, eroded, and finally has ousted the US-backed client regime of Thaksin Shinawatra over a decade of political chaos. In the late 1990's Shinawatra was an adviser to notorious US private equity firm, the Carlyle Group and described himself as a personal friend of the Bush political dynasty. He pledged upon taking political office that he would continue to serve as "matchmaker" between US interests and Thailand's resources. In 2001 he privatized Thailand's resources and infrastructure including the nation's oil conglomerate PTT - which was sold off to foreign interests including Western oil companies, Chevron, Exxon, and Shell. In 2004, Shinawatra attempted to ramrod through a US-Thailand Free-Trade Agreement (FTA) without parliamentary approval, backed by the US-ASEAN Business Council who just before the 2011 elections that saw Shinawatra's sister Yingluck Shinawatra brought into power, hosted the leaders of his "red shirt" "United Front for Democracy against Dictatorship" (UDD) in Washington DC. 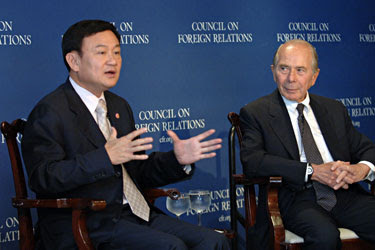 Since the first coup in 2006 aimed at his regime, Shinawatra has been represented by US corporate-financier elites via their lobbying firms including, Kenneth Adelman of the Edelman PR firm (Freedom House, International Crisis Group,PNAC), James Baker of Baker Botts (CFR, Carlyle Group), Robert Blackwill (CFR) of Barbour Griffith & Rogers (BGR), Kobre & Kim, Bell Pottinger (and here) and currently Robert Amsterdam of Amsterdam & Partners (Chatham House). And from 2006 until now, both Western political and media circles have continuously provided favorable spin for Shinawatra and his political proxies. 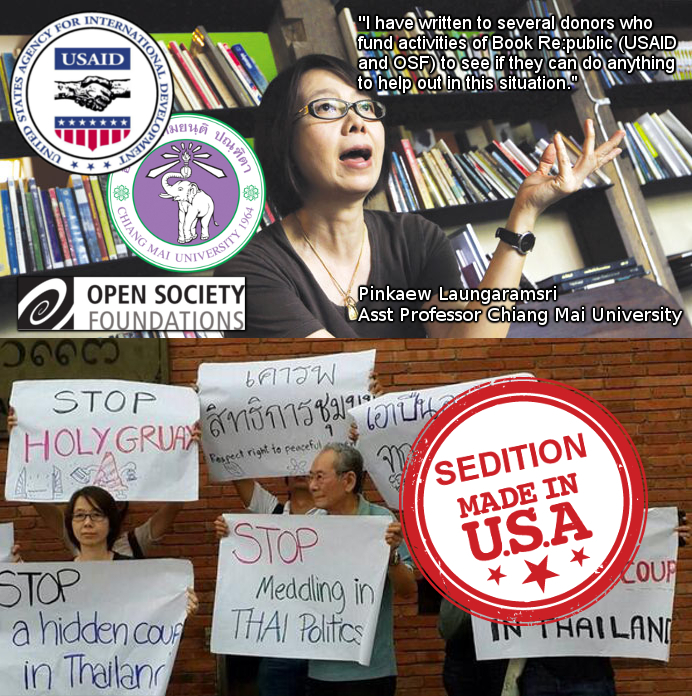 This includes the use of the above mentioned Freedom House and its umbrella organization, the US National Endowment for Democracy (NED) to fund and back nongovernmental organizations (NGOs) and academics in Thailand to provide rhetorical and operation support for Shinawatra and serve as a constant source of sociopolitical subversion aimed at Thailand's ruling establishment. (2.) Thailand's ruling establishment, in the wake of ousting Shinawatra from power, has pursued its own foreign policy, and in particular is seen as aligning closer to China. Since the 2006 coup which sent Shinawatra fleeing, and the 2014 coup which finally began the process of fully uprooting his entire political network, Thailand has moved steadily away from the "American Pacific Century" and toward the rise of China. 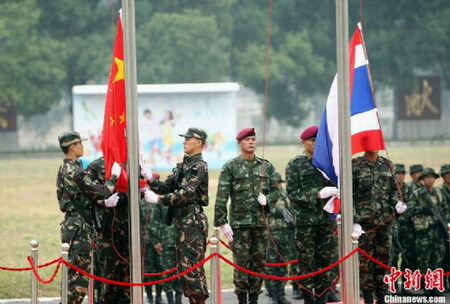 In terms of military cooperation, Thailand has invited China to participate for the first time in its long running annual Cobra Gold military exercise. Once solely a joint US-Thai exercise, it has evolved over the years to reflect Thailand's shifting foreign policy - with China's inclusion indicating Bangkok's recognition of Beijing's growing regional clout. And while Thailand is often accused of having an all-American made military arsenal, most of its US-made weapons are antiquated, including aging M60 tanks. Before the NATO-backed coup in Ukraine, Thailand had attempted to procure T-84 main battle tanks from Kiev. 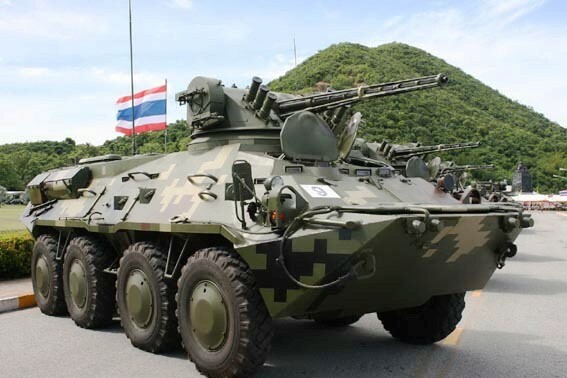 It also possesses nearly 400 Type-85 armored personal carries from China and over 200 Ukrainian BTR-3 armored personal carriers to complement its aging US-made M113 carriers. 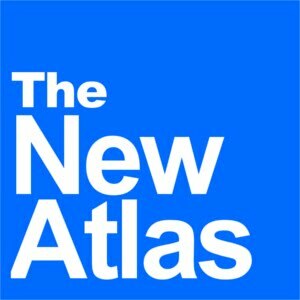 It is clear that Thailand has been in the process of gradually escaping out from under American hegemony for years, with the recent ousting of Thaksin Shinawatra and his regime, along with strengthening ties with China creating an almost palpable desperation for American hegemony in Asia. (3.) 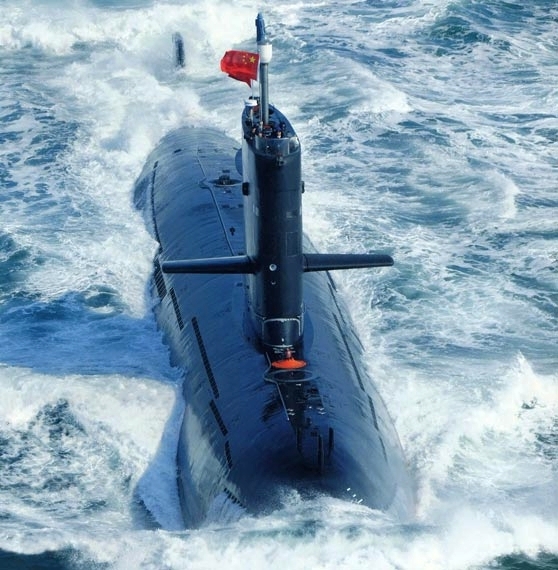 Thailand's ruling establishment refuses to take part in America's South China Sea strategy of tension. Part of America's "pivot toward Asia" was creating conflict in the South China Sea between Beijing and the nations of Southeast Asia. By creating a security crisis Southeast Asia would be unable to solve alone, the US anticipated it would accentuate military and political dependence on the West. Nations including Japan and the Philippines have elected to walk into this conflict fully, expending themselves politically, militarily, and economically to confront and contain China while maintaining America's current regional hegemony. The high-power visit from all branches of Thai military top brasses to China recently - first in 15 years - was a show-case sending a strong message to the US and the region, Cambodia in particular, that the Thai-China defense and security ties are rock solid and must not be the [subject] of speculations. In essence, Thailand serves as a speed bump within ASEAN preventing the supranational bloc from adopting a more belligerent stance toward China regarding South China Sea tensions. This has forced America's proxies to act more unilaterally toward China than with the collective US-backed ASEAN front envisioned throughout decades of US policy papers. Since the Vietnam War, it was clear that American foreign policy in Asia hinged on containing the rise of China and "integrating" it into an "international order" US policymakers admit is an order created by the West, for the West. It was amid the leaked "Pentagon Papers" that this was unequivocally laid out - setting the stage for decades of foreign policy to come. The conspiracy to encircle and contain China originating in the 1967 Pentagon Papers would be reaffirmed throughout the decades within various successive US policy papers. Kagan's column represented more than merely his own observations. The policy of containing China by projecting American power and influence across China's peripheries - including Pakistan, India, Myanmar, Thailand, Malaysia, the Philippines, Japan, and Korea would be a reoccurring theme in the 2006 "String of Pearls: Meeting the Challenge of China's Rising Power across the Asian Littoral," report put out by the Strategic Studies Institute. 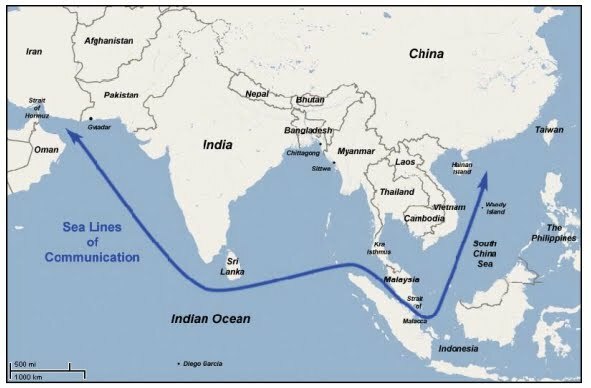 It featured a map indicating China's "String of Pearls," a geostrategic corridor the United States would need to disrupt in order to control China's development. Beyond Thailand, political subversion funded by the US State Department and low-intensity terrorism can be found throughout this corridor, with NED-funded political fronts and their terrorist wings attempting to disrupt China's Gwadar Port in Baluchistan, Pakistan, to NED-funded supporters of Myanmar's Aung San Suu Kyi attempting to overthrow the Sino-aligned government there, to Malaysia and NED-backed street mob Bersih and its leader Anwar Ibrahim, to the South China Sea where US Pacific Command is directly agitating relations across the region. It is no coincidence that US policymakers charged with devising containment strategies for China are also serving as "lobbyists" for US client regimes in Southeast Asia meant to assist in the implementation of this "grand strategy." Thus, the bombing in Bangkok, whether it was carried out by the US-backed regime of Shinawatra itself, US-Saudi linked terrorists from the south, or terrorists the US imported from Chechnya, the Middle East or China's Xinjiang where the US is currently trying to foment yet another violent insurrection, was an act of coercion to steer Thailand away from its own foreign policy, and back toward serving American foreign policy. In terms of military cooperation, economic trade, and political ties, Thailand is not the only nation attempting to escape out from under American hegemony. Malaysia and Myanmar have been fighting very visible battles against US-backed proxies. Should one or more of these states fully escape, it will create a cascading effect that will topple all of America's "Great ASEAN Wall." For BRICS - a geopolitical alliance promoting the emergence of a multipolar world - they must recognize ASEAN's struggle out from under Western hegemony and assist them if even only through the media - exposing to the world the ties between the US and various regional political factions and ties between the US, its allies, and regional terrorist organizations used when staged protests are impossible. For ASEAN states themselves, they must resist the urge to capitulate in the face of terrorism and support neighboring nations in their bid to preserve national sovereignty. It is clear who has an "ax to grind" against Thailand. The only question that remains is how big that ax is, and how many times it will fall upon Thailand before those wielding it can be disarmed.